I originally posted this recipe back in 2011 and it is still one of my family's favorite treats, so it was time to update the pics and share with all of you again. 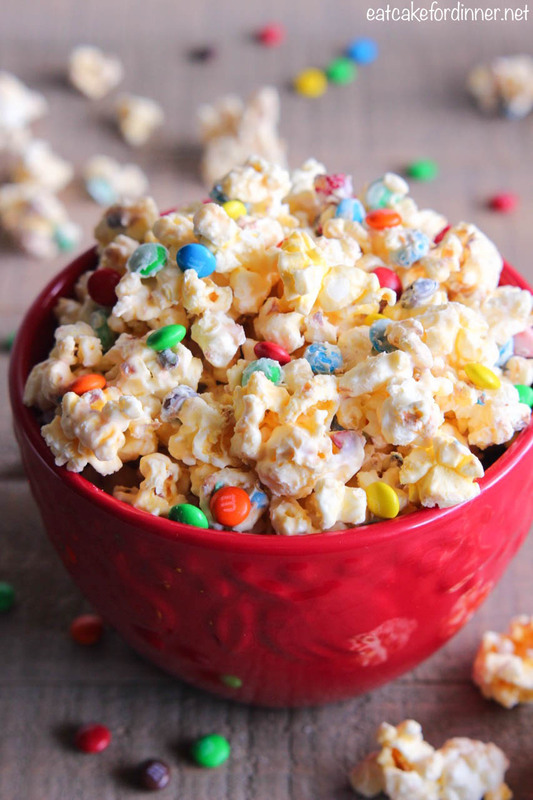 The flavor of this really is amazing thanks to the type of popcorn the recipe calls for. It's also so easy to customize for each holiday by switching out the M&M's you use. Check out my original post down below. If I would have seen this recipe on a blog, I probably would have just passed by it, but lucky for you, my boss makes it for us every year for Christmas, so I know how amazing it is. "Ewe, why did you use buttered popcorn?" I said "Don't knock it until you try it." So . . . he takes a bite . . . takes another bite . . . gets out a bowl and fills it up . . . finishes the bowl and says . . .
"What is this stuff? Why is it so good and why can't I stop eating it?" So, there you have it. This stuff is seriously AMAZING AND ADDICTING! Neither of us have been able to stop eating it for the past three days. I know it sounds strange, but it works. STOP whatever you are doing . . . Get up . . . Get dressed . 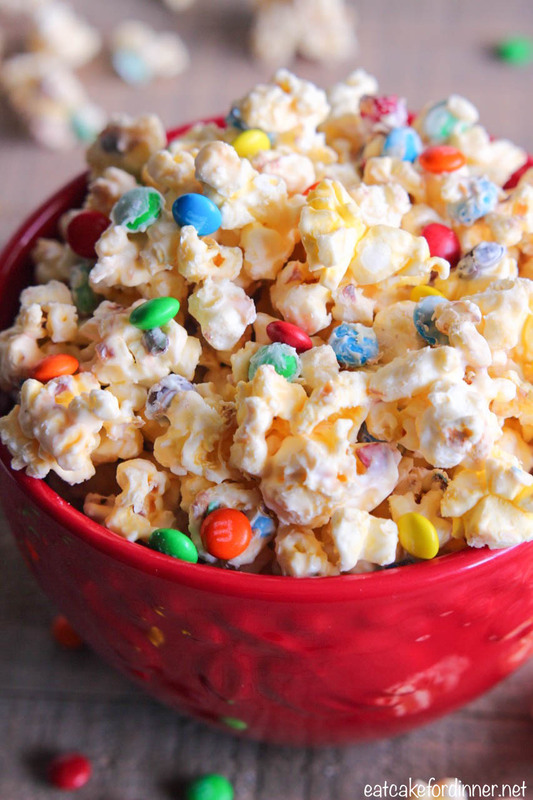 . . go to the store and get some buttered popcorn, white chocolate candy melts and some M&M's and MAKE THIS RIGHT NOW. Pop popcorn in the microwave, DO NOT BURN IT. Transfer to a really large bowl, making sure to get out all of the un-popped kernels so no one breaks their teeth. Melt white candy melts according to package directions. 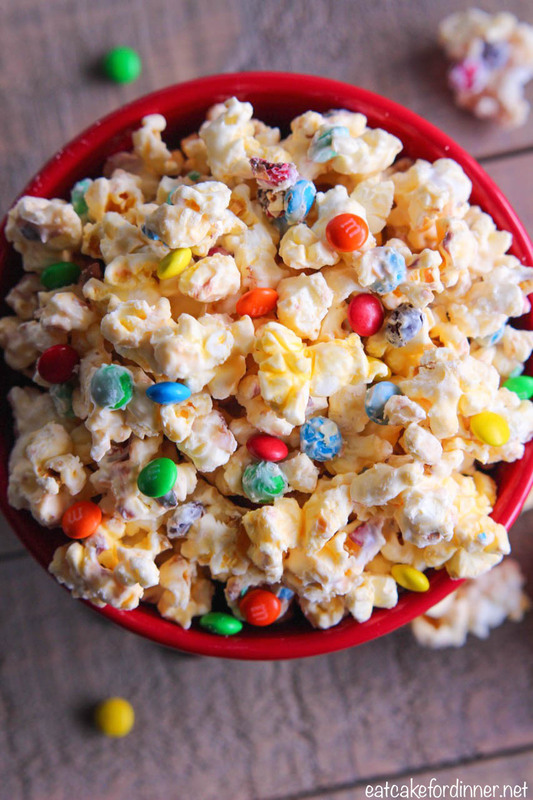 Pour over popped popcorn and add M&M's. Stir until all of the popcorn is coated with chocolate. Let set until chocolate has hardened. When chocolate has hardened, the popcorn will be stuck together in one large ball. So, use a spoon to break it into chunks. Store in an air-tight container. Serve. Jenn's Notes: You can find the Wilton White Candy Melts in the craft section at Walmart or at Craft Stores (Hobby Lobby or Michael's). This popcorn is a great neighbor gift. Add to cute cellophane bags and tie with a ribbon. If you burn the popcorn, don't think the white chocolate will hide the burnt taste, because it won't. If you burn it, throw it out and use a different bag. That is so pretty and no doubt delicious too. This looks really delicious! 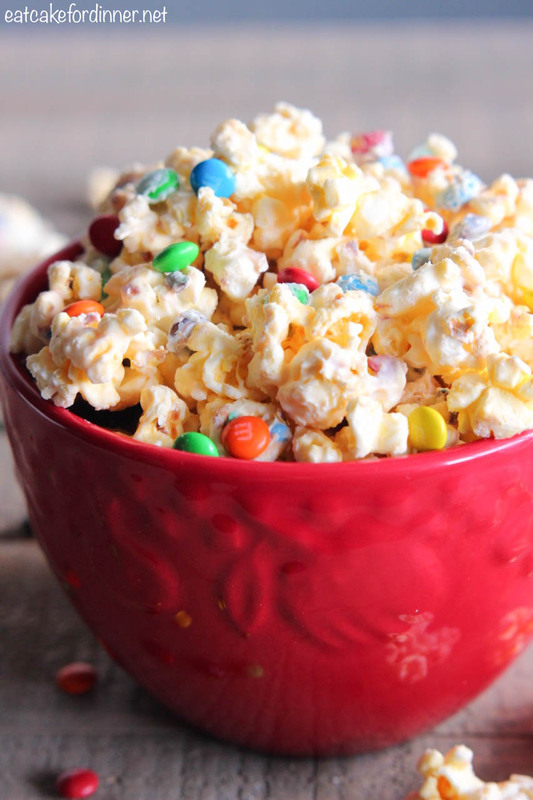 Love the idea of using buttered popcorn, I bet it gives it an amazing sweet/salty flavor!